Lilies are poisonous to cats, and can be very dangerous. Find out more about which lilies are toxic to cats. As any cat owner will tell you, our feline friends are inquisitive creatures and can't resist investigating the world around them, but accidentally ingesting the wrong bit of vegetation can have dire consequences. Lilies are a big 'no-no' for feline-friendly homes and gardens. Just one lily leaf, if eaten, can kill your cat - but any part of the plant is dangerous, including the pollen and flower. Simply brushing by the plant, then grooming the pollen off his coat, can prove lethal to a cat. Take care to avoid the Easter Lily (Lilium Longiflorum), the Tiger Lily (Lilium Tigrinum), the Rubrum Lily (Lilium Speciosum), the Stargazer Lily (Lilium Orientalis), the Japanese Show Lily (Lilium Lancifolium), Asiatic Lilies and species of the Day Lily(Hemerocalis). However, it is wise to be cautious with all types of lily if you're a cat owner. 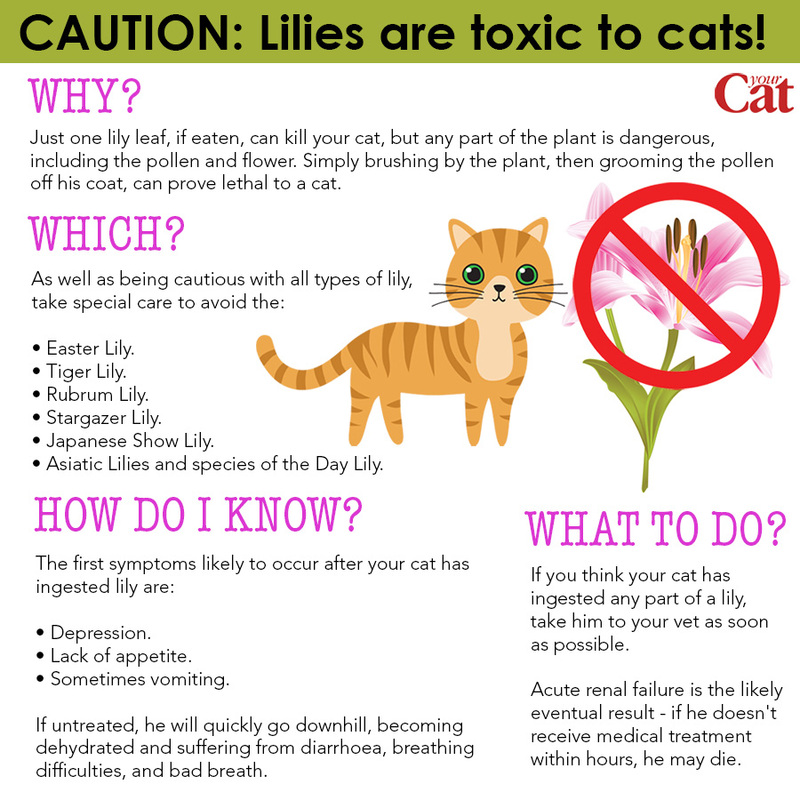 How do I know if my cat has been poisoned by a lily? The first symptoms likely to occur after your cat has ingested lily are depression, lack of appetite and sometimes vomiting. If untreated, he will quickly go downhill, becoming dehydrated and suffering from diarrhoea, breathing difficulties and bad breath. Acute renal failure is the likely eventual result - if he doesn't receive medical treatment within hours, he will probably die. 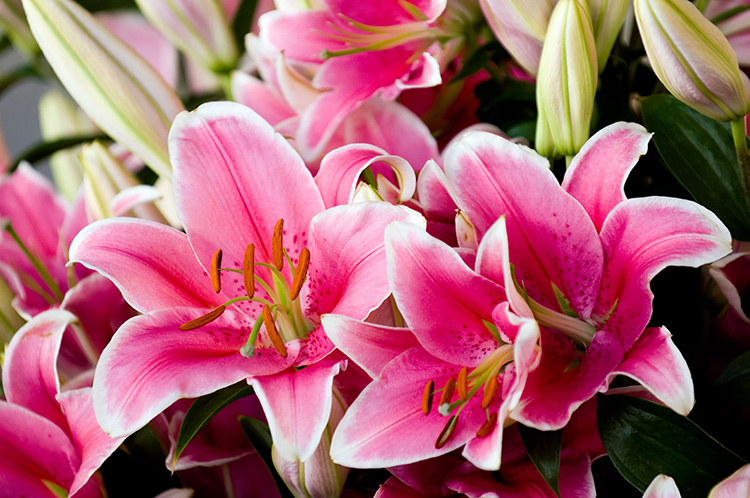 If you think your cat has ingested any part of a lily, take him to your vet as soon as possible. The Veterinary Poisons Information Service warn that ingesting azalea, oleander, sago palm or yew plant material can be fatal for pets. Lilies aside, cat owners should also be wary of cyclamen, poinsettia, amaryllis, holly, ivy, mistletoe, daffodils and foxgloves, to name a few. Laburnum, some berries and toadstools can also occasionally cause problems. Take the time to go around your home and garden and examine thoroughly exactly which plants you have growing there. List both the plant's common and Latin names, as this may help your vet if he suspects your cat has been poisoned. Read more about which plants are toxic to cats here. If you're planning on enclosing your garden or building an outdoor run for your cat this is important - even if your cat hasn't shown much interest in certain shrubs, trees and plants before, they may come under closer feline scrutiny if he's shut in with them.